While bed bugs do not transmit diseases, they are upsetting, can be hard to get rid of and will definitely need treating with an appropriate insecticide. Bed bugs are small insects that feed on your blood, often causing itchy bites. They tend to live around your bed and travel on clothing, furniture, bedding and luggage. They are are oval-shaped and flat and can grow up to 5mm long, changing colour from cream to brown as they mature. While bed bugs need to feed on blood to grow, they are resilient and can live for up to a year without a feed. Bed bugs tend to live in cracks and crevices in and around your bed, especially in mattress seams. There are a number of preventative measures you can take on an ongoing basis to reduce the risk of getting bed bugs and other pests such as cockroaches and fleas. Regular vacumming of areas they are likely to hide, remember to removing mattresses from bed frames. A great trick is to use “talc powder” and apply to the area on a regular basis to eliminate pests harbourage & laying eggs. 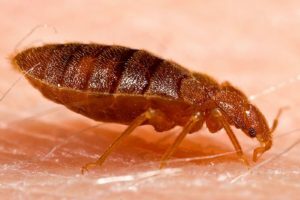 If you have an infestation of bed bugs, you will need to get the help of a professional pest control company such as TruHome – contact Joe for more information. This video shows how our bed bugs treatment includes a thorough vacuuming prior to spraying – and not just to the mattress/bed but also to bedside furniture and cracks and crevices around skirting.